Nintendo Labo series off to a good start. 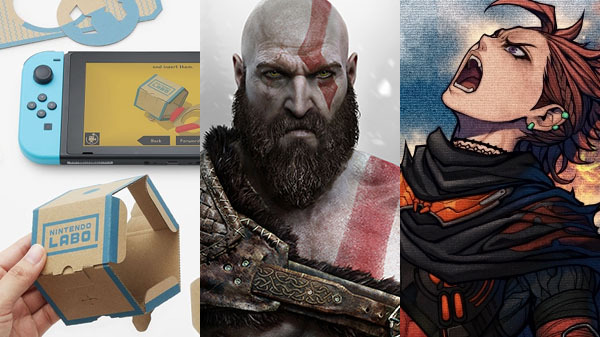 Nintendo’s cardboard construction game series Nintendo Labo Toy-Con 01: Variety Kit and Nintendo Labo Toy-Con 02: Robot Kit for Switch debuted at 90,410 and 28,629 respective retail sales, the latest Media Create sales figures reveal. The new God of War for PlayStation 4 debuted at 46,091 retail sales during its first three days of release in Japan. Also new this week, Kadokawa Games released Metal Max series 25th anniversary title Metal Max Xeno, which sold 15,044 retail copies on PlayStation 4 and 8,355 retail copies on PS Vita for a total of 23,399 sales. On the hardware side, Switch sold 34,165 units, the PlayStation 4 family sold 13,447 units, and the 3DS family sold 7,472 units.